Product #15855 | SKU DDJ-SR | 0.0 (no ratings yet) Thanks for your rating! 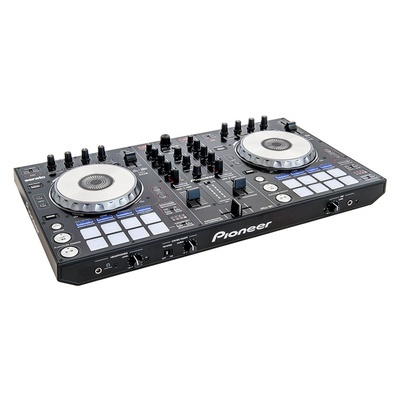 The DDJ-SR 2-Channel Performance DJ Controller from Pioneer is designed to provide hands-on control of Serato DJ software. It features 2 low-latency jog wheels as well as 16 illuminated performance pads (8 per channel) that provide touch access to commonly used effects and functions such as hot cue, roll, slicer, and sampler. The Pad Plus function allows you trigger multiple effects with just one button. The controller has a 2-channel mixer with a cross fader reverse feature that allows you to switch your left and right decks. Built-in deck select buttons allow you to integrate 4 decks into the mixer for added versatility while performing. The DDJ-SR has an integrated USB sound card as well as a 1/4" microphone input for using analog sources. Rubber performance pads located below the big jog wheel provide hot cue, roll, slicer and sampler functions. Each soft-touch rubber pad illuminates in blue to enable users to tap the pad(s) quickly for each effect, with the output volume varying depending on the strength of each tap.